Duke University awarded more than 5,500 undergraduate, graduate, and professional degrees during its annual commencement ceremony Sunday, May 13. About 13,000 family, friends, and guests traveled to Durham to celebrate the class of 2018. 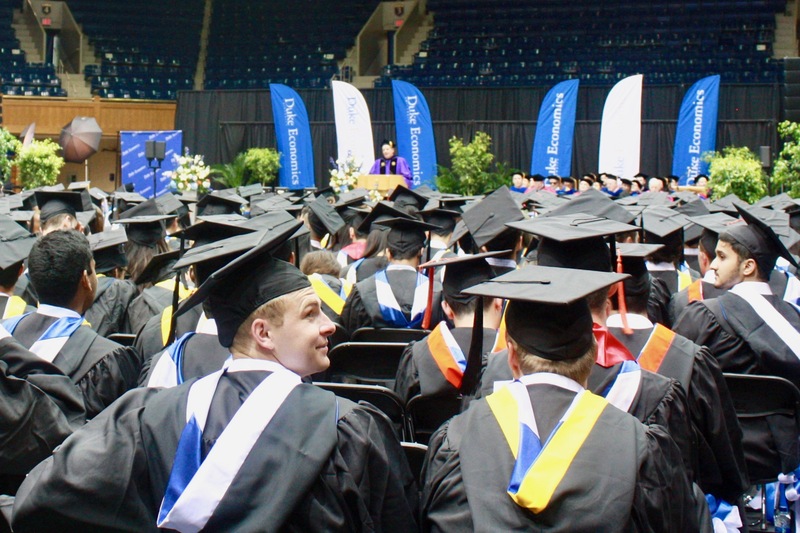 Immediately following the university’s event, the Department of Economics presented diplomas to graduates at its annual Graduation Recognition Ceremony in Cameron Indoor Stadium. This year members of the faculty presented diplomas to 14 Ph.D. graduates, 64 M.A. Economics graduates, eight M.A. Analytical Political Economy graduates, nine M.S. Economics and Computation graduates, and 219 graduates with an economics major. Senior Maya Durvasula, a Truman Scholar and winner of this year’s Best Honors Thesis Award, was nominated by faculty to be the student commencement speaker. Durvasula graduated with an economics major as well as a minor in mathematics and a certificate in politics, philosophy, and economics. Drawing upon her past experience working in state politics, Durvasula spoke about the importance of understanding why and how well program sand systems work, and how an economics background provides the framework through which graduates can better understand the world. The following Allen Starling Johnson, Jr. Awards for Excellence in Undergraduate Research allow for recognition of those outstanding students whose work stands out among the 37 honors students this year.